Co-founder and chief executive officer of WealthBar, a robo-adviser service. I'm sitting in an early morning, investment banker meeting in the boardroom with a couple of buttoned-down money-men in pinstripe suits. A stray moment of doubt puts a wrinkle above my right eye as my irrepressible two-month-old bouncing baby boy latches on to me for his second meal of the day. Did I make a mistake? Is it about to get awkward? 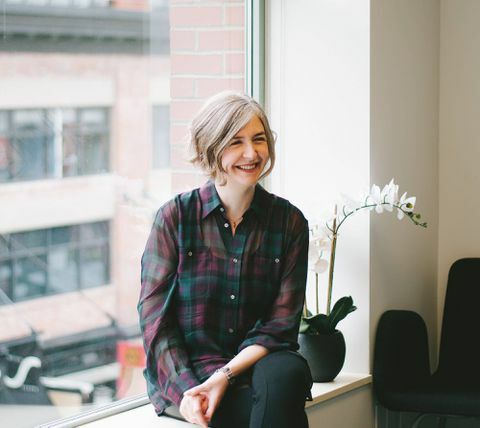 I'm the co-founder and chief executive officer of an online wealth management company based out of Vancouver – and I love my job. Strategizing, publicizing, raising capital, putting out fires and setting off sparks of innovation – I'm happy when I'm working. But I'm also the mother of a baby and a six-year-old daughter. My kids are my life, even on days when they're doing their absolute best to drive my husband and me completely crazy. It's a struggle, as every working mom knows (not just CEOs), but along the way, I've tested out a few ways to nurture both my real family and my fintech work family. Because it's going to happen. You might as well make the best of it. Getting back to that scene in my boardroom: as it turned out, the kind gentlemen sitting across from me at the meeting weren't rattled at all. The truth is that they were overjoyed to have a baby in the room. It was the highlight of their day. Right after we were done with the negotiations, these proud fathers were opening up their smartphones to show me pictures of their own kids, while cooing and making funny faces to my newborn. It was such a blast for them. Far from being awkward, it set the stage for a happy and productive meeting of the minds with these stakeholders. I'm not saying it's a brilliant idea to bring your baby to every important meeting on your calendar. But, as a mom, don't be afraid to push the limits of corporate decorum. The men and women you're dealing with in business settings weren't born in sterile cloning jars. Life happens – and with a little understanding from both sides, it can be a very positive thing. Within hours of being a new mom again, I went into a hyper-controlling mode. It's hardwired into our hormones to throw virtually all attention and energy into keeping our baby safe. That's a good thing! But eventually, you return to a more balanced mindset where you're not spending literally every second of your day paranoid about your child's well-being. Still, I could totally relate when another top executive mom-boss I know well came to me, totally exasperated. She was practically in tears. This strong, intelligent, resourceful woman told me about how she was running out of steam, trying to manage her kids and her job, basically trying to control every possible variable at work (and leaving nothing to chance with her team). I recognized the mindset she was in, because I had been there. That is probably why she was willing to listen to my advice. I told her that, when you do have that important meeting where you need to focus and not bring the baby with you, leaving the baby with a care provider is not the end of the world. Your kid still may make it to Harvard if they miss a nap or have apple pie for dinner. Don't be flaky. Set rules, but allow for exceptions. While we, as parents, assert boundaries for our children for their well-being, straying from those norms once in a while will not break your baby. My kids are the living proof of that. At the same time, don't bring that controlling mindset into the office. Your team will be there for you. That's true even if that means they step in as your kid's brand-new aunt or uncle for five minutes while you jump on a call with your biggest client; okay, especially in that case. The people from the agency seemed pretty surprised when I showed up to the big rebranding meeting on day two of being a new mom. (To be honest, so were some of the people on my team.) But that was my choice. It was an important moment for our company, on the verge of achieving an important milestone; as co-founder, I had to be there. But for the women at my company, this is not the standard. And knowing how this particular instance might look, I wanted to make sure they knew it. I convened an impromptu meeting to discuss this aspect of our company culture. Hilariously enough, for me at least, all of the ladies on the team (about half of the company) nearly ran for the exits when I brought up the prospect of them having babies of their own. Must be a generational thing! Well, if they do change their minds, all of my employees know that they have my full support. If they want to take time off to be a parent, I want them to do that and welcome them back to our work-family as soon as they're ready to keep growing with us. I don't have all the answers. And to be honest, there are times when being the Mom Boss can feel overwhelming. If there's anything you can take away from my lessons learned, it's that you're not alone. As a founder, your company might be your baby. But if you've hired right, you've got a family to make sure it grows up right. Executives, educators and human resources experts contribute to the continuing Leadership Lab series.